The model 05455 foldable tablet table stand makes it easy for you to mount your phone or tablet to a table or on any flat surface. By mounting your device up and out of the way, you are protecting it from potential harms, such as heavy books being placed on it or spilt water. 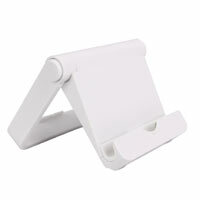 Placing angle adjustable by pressing a designed button, the tablet stand is free to be folded or adjusted to the angle you need. Sitting space is large enough for most tablets even with protecting cases. 4.06" x 3.74" x 0.75"